Since last writing about MobileFamilyTree in August 08, they've added photo support - just what I was looking for. I've got a whole bunch of photos now inside my genealogy program on my iPhone! I just visited MobileFamilyTree's website today and they are touting a new upgrade to their mobile genealogy app. MobileFamilyTree 2 is on the verge of release in the iTunes store. The big feature I am looking forward to is the photo media browser already available on the extremely powerful desktop product: MacFamilyTree. The media browser will make it easier to manage photos from the iPhone. 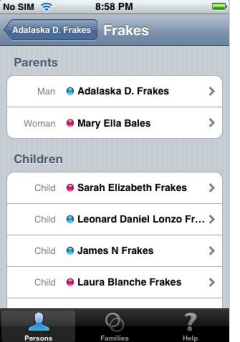 I've already been using the first version of MobileFamilyTree on my iPhone with relatives when I visit. It helps tremendously and gets some excitement going to have my entire family tree in the palm of my hand. I can enter data when my relative tells me about someone - both the genealogical details like birthdate and place but also stories. The current version of MobileFamilyTree is 1.33 (itunes store link). You can acquire the app now and get a free upgrade (or at least that almost always works) when 2.0 is released. By the way, my Dad is the guy on the left above with the surf board and my grand mother, Theresa Jane Zollner Frakes is below. I do love genealogy and hope to be more active with this blog. I strongly encourage you if you have the least bit of aptitude or interest to start your own family blog. Treat Brothers and Sisters as Equals. One Source Doesn't Equal Proof. Each has links to additional detail but the article itself is short and sweet. Enjoy. 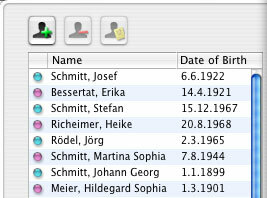 I just downloaded MacFamilyTree 4.06 and the new version's charts have navigation icons on each person to get to their summary, edit their record or go to parents or children. When you click the icons, they zoom out to a larger size. Very slick! You can choose between color schemes. The good looks we are seeing now are just the beginning of an on-going effort to make genealogy beautiful! These are my grandparents on my Mom's side and their parents. I was happily using Reunion 8 to track my family tree until I got a look at the beautiful charts that MacFamilyTree 4 produces. Wow! MacFamilyTree 4 feels like a young program. In fact it is. It's been built from scratch for the Mac OS X platform. It uses all the built-in capabilities of X like image resizing. There's a little slider that lets you view charts at any size with instantaneous and smooth expansion and contraction as you move the slider. Being young, it has its moments but also has rough spots here and there. I'm guessing that you can learn your way around the rough spots and do great with it - and it's only $45. I recommend that you pop open the help right away because they give you a few getting started tips that will help you avoid a couple of the rough spots. 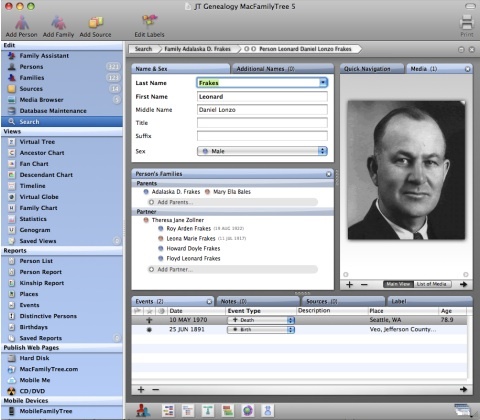 Right now this is the *fun* genealogy program and Reunion 8 is the *serious* genealogy program for Mac. I'll be using both for a while because fun is a priority for me. MacFamilyTree uses the GED 5.5 format rather than a proprietary data format. There may be some limitations to that, but it's also nice to know that everything you do in the program can be exported to GED format. Reunion 8 can export to GED as well but since that format isn't it's native format, you can't be sure everything will be exported. I've entered about 40 records into MacFamilyTree and I must say that it's faster to enter into Reunion 8. But then, part of that is that I'm used to Reunion. And part is that Reunion has a few more data entry aids. It might make sense for me to enter data into Reunion and then export it periodically into MacFamilyTree when I want to print charts or post an updated family tree to my website. Hello there. Welcome to my genealogy den! I've just recently acquired the genealogy bug after a brief flirtation eight years ago. I'm really into it. This isn't my first blog - it's my fourth. Maybe you've seen my Tech Ronin blog. This whole new bout of genealogy passion started shortly after I bought my Zire 72 in May. I was looking around for cool software to put on my Zire and found a little program called MyRoots. I promptly downloaded the demo, tried it and then bought the full version. I have never had my genealogy data in my hand - always with me - before. How fun! I dug out some of my old files and entered a lot of my genealogy data into my Zire, person by person. I probably entered 50 people over the next few days. I could enter a lot of it by memory whenever I had a few minutes here and there waiting for something else to happen. Getting the 5000 Frakes census records and connecting with George Frakes was just the shot in the arm I needed to take things to the next level with my budding genealogy hobby. George subsequently sent me a great big family tree print out showing me what he knew about my Frakes ancestors. Entering this abundance of data on my Zire wasn't going to work and I wanted to work with photos. I needed to buy a desktop genealogy program. I had used Reunion 4 and 5 back in the 90's, so upgraded to Reunion 8 which runs on OS X for about $70. I downloaded a free utility for MyRoots that let me export the data in MyRoots into a GED file - the standard data format for genealogy programs. I imported my existing data and have been entering data like crazy since then. Right now I have a total of 289 people in there. I got my old photos out and started scanning and putting some of them into Reunion. I printed some family trees and sent one plus some scanned photos to my 82-year-old uncle, Roy Frakes whose already told me a juicy story about my great grandmother. I've bought about 5 books on genealogy and am generally having a great time. This hobby is a great one to share with my 88-year-old father who loves to look at old family photos and reminisce about herding cattle while riding his horse Rex on his family farm in Montana. Here's what I think about genealogy so far. For someone like me who likes to learn, *collect* things and play with computers, it's awesome. To do genealogy *right*, you've got to learn a lot of geography and history. I'm collecting maps and local histories of the various places my ancestors have lived. That's a lot of places when you've got 289 and counting spread over three centuries. If that weren't enough, this all ties in with my interest in social networking. This hobby gives me instant and very interesting conversation material for all my living relatives plus every amateur and professional genealogist out there. I'm hoping you'll join me and start by writing a little comment to say hi, ask a question or express your thoughts.